In the meantime, here are the important nuts and bolts of how to submit and vote. – Beginning 4/21, Simply post your entry directly to The Watering Bowl’s Facebook page. – Don’t forget the rescue hashtag! If your dog wins, so does your favorite rescue. $500 for each of you to be exact. Oh, and don’t forget to include your dog’s name so we can give proper credit. Now, the good stuff. Please read carefully. – We will post an album of all of the photos on Facebook on the morning of April 25th. Those are the only photos that are eligible for voting. – Only votes received on those photos in the album between the morning of 4/25 and 7:00 pm on 4/26 will count. – And remember, 1 like = 1 vote (liking a “share” won’t figure in the voting, so make sure you like the actual photo to make your vote count). Oh, and you don’t have to be a current TWB client to participate. So tell your friends! It’s so on. And For those who don’t know, the history behind the Hangover phenomenon, pull up a chair. It all started shortly after we opened our doors. Because we were one of the first cage-free doggy daycares in St. Louis, not everyone knew quite what to expect after a full day of play at The Watering Bowl. Of course, it’s great for the dog. They get to stretch all four legs and meet new best friends constantly. But when they get home, they are more than ready for a nap. Maybe a couple naps. Maybe a full day of napping is in order. And when dog owners noticed their pups sleeping through the mailman after their stay, they wondered if that was normal. Once people got it, they were excited. 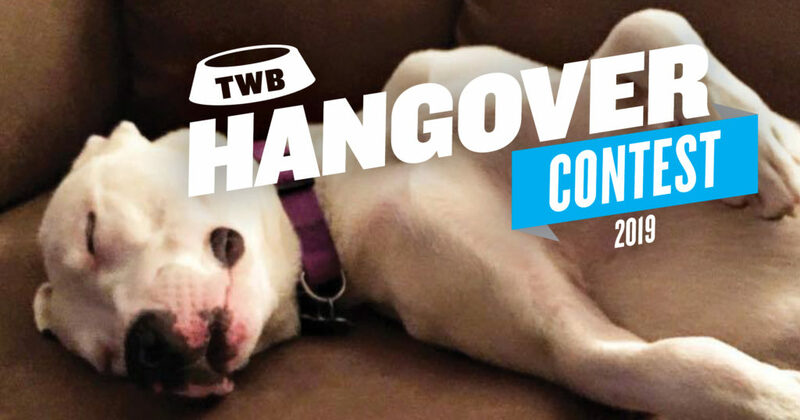 We started to see photos of passed out pooches and decided to turn it into a contest. Because, while you’re accustomed to seeing beauty shots of dogs playing, you don’t always see a dog sleeping (hard) when you’re scrolling through your feed. And the harder they sleep, the better the photo. 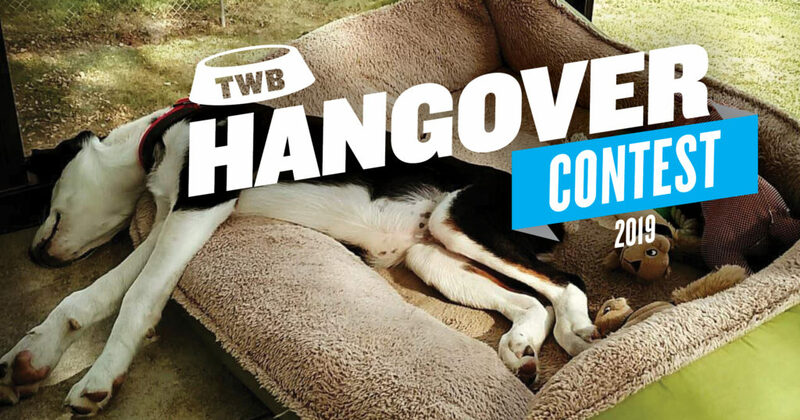 You can dress the scene to up the ante and increase your chance of winning the $1,000 prize for the best photo in the Hangover Contest. In fact, we encourage you to get creative. The dogs do, too. Because $500 of the prize goes directly to your rescue organization of choice. The other $500 goes into your pocket. And this year, we have a special wrinkle we’re planning on adding to the prize package. So stay tuned. For now, mark your calendar and plan your photo session.